At this stage, it does not seem that the Yosemite stack accepts or initiates MPTCP connections. 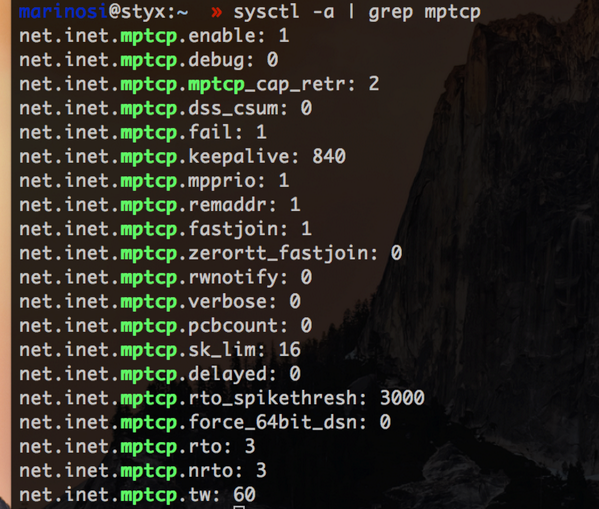 If someone knows how to use MPTCP on Yosemite, please post comments here. It’s in the source: http://www.opensource.apple.com/release/os-x-1010/ , but surrounded in compiler macros . The macros relegate the code to private headers and kernel private headers. Right now i’m working at pulling in the private headers to compile and use it. I’m unsure if it will work, but i am sure it’s compiled into in the kernel from doing symbol dumps of the release kernel. Any news here? I’d love to use MPTCP with OS X 10.11, but can’t find anything how to configure/actually use it.